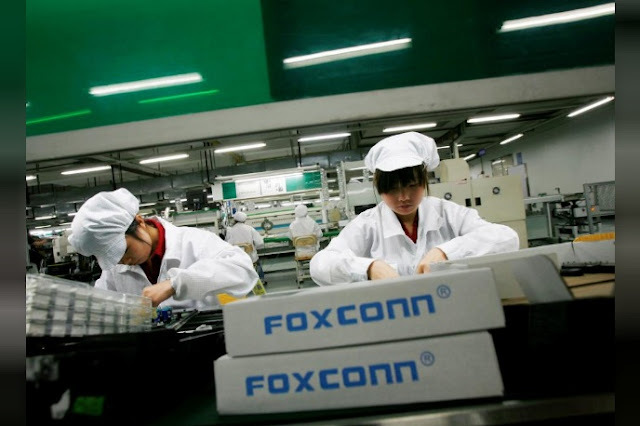 FILE PHOTO: Employees work inside a Foxconn factory in the township of Longhua in the southern Guangdong province May 26, 2010. BEIJING - China’s producer price inflation unexpectedly accelerated to a six-month high in September as a construction boom shows no signs of abating and a government crackdown on air pollution triggers fears of winter shortages and frenzied jumps in commodity prices. China’s strong demand for building materials has triggered a year-long commodities rally which is helping to buoy manufacturing activity and inflation around the world, even if it has yet to trickle down to the consumer level. China’s economy is expected to grow 7 percent in the second half of this year, the country’s central bank governor said, defying economists’ expectations for a slowdown. The producer price index (PPI) rose 6.9 percent in September from a year earlier, from 6.3 percent in August, the National Bureau of Statistics (NBS) said on Monday. The gain - the strongest since March - signals continued resilience in China’s economy and industrial sector profits, welcome news for Communist Party leaders two days ahead of a twice-a-decade party congress. Analysts polled by Reuters had expected September producer inflation would be steady from August at 6.3 percent. On a month-on-month basis, the PPI rose 1.0 percent in September. China’s commodity futures prices have seesawed wildly in recent weeks as the government embarks on its biggest environmental crackdown yet to reduce the country’s notoriously thick winter smog. Some steel mills, smelters and coal companies have cranked up production ahead of expected official curbs on output or outright shutdowns in coming months. Environmental inspections have disrupted some supply lines and added to uncertainty in the market. Shanghai steel futures surged nearly 7 percent on Friday, spurring a similar rally in raw materials iron ore and coking coal. Iron ore and coal prices had tumbled sharply in September on fears of weaker demand for raw materials, but traders are confused as to how the winter supply and demand picture will play out and how much of the impact will ripple through into global commodity markets. Top steelmaking city Tangshan became the latest to enforce production cuts this month, ahead of the previous deadline of Nov. 15, when winter heating systems in China are switched on. Bolstered by manufacturing and a hot property market, China’s economy grew by a faster-than-expected 6.9 percent in the first half of 2017. China will have no problem meeting its economic growth target of around 6.5 percent this year, and may even beat it, the head of the Statistics Bureau said last Tuesday. Analysts still predict producer prices will start to soften in the fourth quarter due to a high base of comparison last year and as overall demand moderates along with economic growth. China’s consumer price index (CPI) rose 1.6 percent as expected in September, versus 1.8 percent in August and well within Beijing’s 2017 target of 3 percent. Food prices, the biggest component of the consumer price index (CPI), fell 1.4 percent from a year earlier. Non-food price inflation quickened to 2.4 percent in September from 2.3 percent in August. China’s producer price inflation unexpectedly accelerated to a six-month high in September as a construction boom shows no signs of abating and a government crackdown on air pollution triggers fears of winter shortages and frenzied jumps in commodity prices.